There's similarities between these two high-yield renewable power players, but some big differences too. Renewable power is an increasingly important source of electricity around the globe. 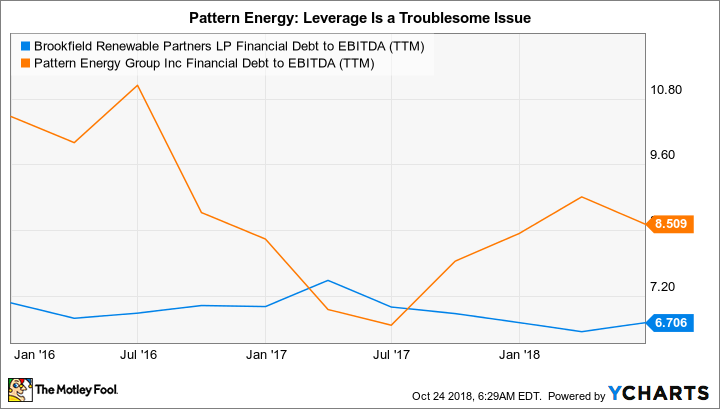 If you are a dividend investor looking to add a renewable power stock to your portfolio, then you've probably already stumbled upon Brookfield Renewable Partners LP (NYSE:BEP) and Pattern Energy Group Inc (NASDAQ:PEGI), which yield 6.7% and 8.9%, respectively. To be fair, the partnership is expecting an adjusted funds from operations payout ratio of 100% in 2018, so there is some uncertainty here as well. However, Brookfield Renewable Partners is in a better financial position to deal with the issue. Moreover, it is targeting a payout ratio of around 90% by 2022 after accounting for sustaining capital expenditures. And, equally important, it has provided a plan for how it will get there. This plan includes contractual cost escalators, efficiency improvements, and ground up construction, which together are expected to grow funds from operations between 6% and 11% a year over the next five years.